India and Egypt have a lot in common.Both are ancient civilizations. Trade ships used to ply between the West coast of India to Egypt as documented in 1st century book, The Periplus of the Eritrean Sea. Following Independence, Chacha Nehru, along with a bunch of people founded the Non-Aligned Movement and conned a bunch of countries to join so that they could align themselves with the Soviet Union. One of Nehruji’s friends was Gamal Abdel Nasser of Egypt who in 1967 Tughlaqian move tried to wipe Israel off the map. A lesser discussed fact is that both Delhi and Cairo were once ruled by members of the Slave Dynasty who were Turks. Nothing illustrates this better than the story of two such Turks, Baibars  and Qutb-ud-din Aybak. Baibars was captured by the Mongols, sometime after 1223, and sold as a slave. He was passed up by many buyers since he had cataract. Sold at a discount, he ended up in Syria and was later sold to an Egyptian Mamluk. He had charisma and soon became a commander defeating the Seventh Crusade by Louis IX of France. A quick promotion and he became the Sultan of Egypt ruling about half a million people. Baibars was a Mamluk – a Turkish speaking warrior class who ruled not just Egypt but Syria and Palestine, thus controlling Jerusalem. The Mamluk tradition was to capture pagan boys as slaves from the north of Black Sea and Caspian Sea. The captured boys were converted to Islam, trained in religion and warfare, and given freedom and employment. They remained separate from the Egyptian population.They were patrons of Islam, building mosques and madrassas, and hence was tolerated by the local population. Qutb-ud-din Aybak was born before Baibars in Central Asia and captured as a slave when he was a boy. He was sold to a qazi of a town in Iran who gave him very good education. After the qazi’s death, his sons sold him to a slave merchant and finally he was bought by a person called Muhammad of Ghor. Muhammad of Ghor soon owned a major portion of India. He had one problem though – no male heirs. But he had a way around it which was clarified by the remark, “I have thousands of sons, my Turkish slaves who will be the heirs of my dominions, and who, after me, will take care to preserve my name in the Khutba throughout these territories.” After Muhammad’s death Qutb-ud-din Aybak established the slave dynasty in India. This is a slumdog millionaire story which even Vikas Swarup can’t make up. In Egypt, minorities like Jews and Christians were treated as second class citizens during the Mamluk era; they had to wear distinguishing clothing. Sometimes synagogues and churches were destroyed to build mosques.This was the time of crusades and some believe that the attacks on Jews and Christians of Egypt were a reaction. 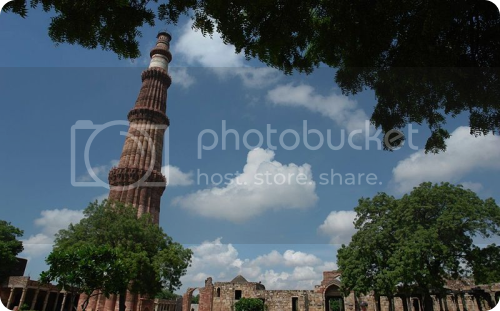 In India which was not affected by the Western crusades, Qutb-ud-din Aybak, who constructed the Qutub Minar inspired by the Minaret of Jam, would also build the Quwwat-ul-Islam mosque from the parts of twenty seven Hindu and Jain temples. In Varanasi, Aybak demolished idols in a thousand temples and made them the place of worship of one true God. Apart from such religious tolerance, a major achievement of the Mamluks was keeping the Mongols out. Due to this Cairo prospered and became a refuge for scholars, artists and merchants and became a cosmopolitan center among Islamic countries. In India, Gengis Khan crossed the Indus in 1222 and a similar exodus of Muslim refugees into India happened making Delhi a another Islamic cosmopolitan center. The Mongols would try again, after Raziya Sultana’s time, but would be held back by another slave, Ghiyas ud din Balban. When Ibn Battuta visited Cairo in 1326, it was still under Mamluk control; they would be defeated by the Ottomans. By the time he reached Delhi in 1333, the Tughlaq dynasty was in power; the Turkish slave dynasty was put to an end by the Khilji dynasty in 1290. Making of the Modern World 4, Lecture 2, by Prof. Mathew Herbst. Aybak was called “Aybak” because he had a broken finger in one hand. so say persian chronicles tabAqat-i-nAsIrI and riyAz-us-salAtIn. really it is very interisting to study. I came here for the first time and being a history buff myself, stayed on to read this piece. Just two observations; the mocking tone for Pandit Nehru in particular and bias against non-alignment is in bad taste. The line about Nassir trying to distroy Israel reflects shallow understanding of the complexities of the Middle East. Please raise the scholarly bar here. On idols destroyed in a thousand temples in Beneras by qutub-al-din Aibak, what’s the source? Nadeem, Welcome. Why should one be respectful of Nehru? You should search for Nehru on this blog to see what I think of him and the non-aligned movement which was not really non-aligned. The reference for the temples is given in the article itself. You should be able to spot it.